With our Quick Start program, you could be up and accepting credit cards in just three days! Just fill out the simple form and get on your way to making the most of every sales opportunity! “Any application we receive by 10:30 am Central Time is 90% of the time approved the same day. Exceptions involved more complicated merchants or out-of-the-ordinary requirements. We usually program a newly approved merchant the same day or the following morning. Overall, you’ll be up and running in 48 business hours. What are Veritrans application approval rates? Over 98% of our merchant applications are approved. What exclusive benefits do you give to seasonal merchants? While many of our competitors charge seasonal merchants monthly minimums and billing fees throughout the year, we shut-off billing during their off-season. We also offer low-volume or start-up merchants an exclusive Touch-tone payment processing program, ideal for those not wanting to buy or lease a credit card machine. What is your Lowest Cost Guarantee about? That’s simple, we guarantee that the total cost for your merchant account and credit card processing is the lowest available. When considering costs, we take all costs concerning credit card processing into account. Some of these include merchant account rate, terminals/software, monthly minimums, equipment warranties, supply costs, etc. What’s the difference between processing a credit card vs. a debit card? Although these cards may have the VISA or MasterCard logos, they are NOT credit cards. These cards are linked directly to the card holder’s checking account and will only be approved for a transaction if there are sufficient funds to cover the transaction. There are two ways a merchant can process a check card, by entering their pin number into a pin pad or by swiping the check card the same as a credit card. Online debit is also referred to as “pin based” debit. A merchant must be set up to “capture” check card Personal Identification Numbers (PIN) using a pin pad connected to the merchants’ terminal. By capturing a PIN, the merchant will be charged a transaction fee (debit fee) instead of paying his/her qualified rate. Why don’t you list “as low as 1.39%” for your rates? Using a teaser percentage rate like 1.39% is misleading. While no one wants to pay high rates, we don’t know what a merchant’s rate structure will be until we understand their individual business. Because all merchant rates are set by the credit card companies including VISA, MasterCard, American Express, and Discover, credit card processors can’t have merchant rates lower than the rates set by the credit card companies! 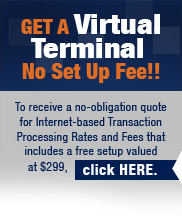 What matters most is paying the lowest total cost of ownership for your credit card processing. Why don’t you offer free credit card machines? Ever hear the phrase, “If it sounds too good to be true, it probably is?” Free credit card machine offers typically include inflated prices elsewhere in the contract to redeem the free machine cost. Review your contract or proposal closely for hidden fees. If you add these fees up, you may discover that the extra costs will be equal to the price of the credit card machine! You may get a free machine but end up paying more in the end. Leasing is ok in some cases, but in most cases, you are better purchasing one.